With his second album, Dylan's delivers his first masterpiece. 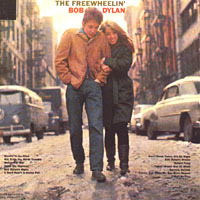 Among the 13 tracks there are several of the best Folk songs of the 1960s, on most of which Dylan combines his contemporary lyrics with traditional melodies. On "Corrina, Corrina" Dylan performs with a backing band for the first time on record. The album ranks on #97 on Rolling Stone's "The 500 greatest albums of all time" list, and it was one of the first recordings chosen by the Library of Congress to be added to the National Recording Registry.